Ankara explosions: More than 80 killed by twin bombings during peace rally in Turkey, officials say. 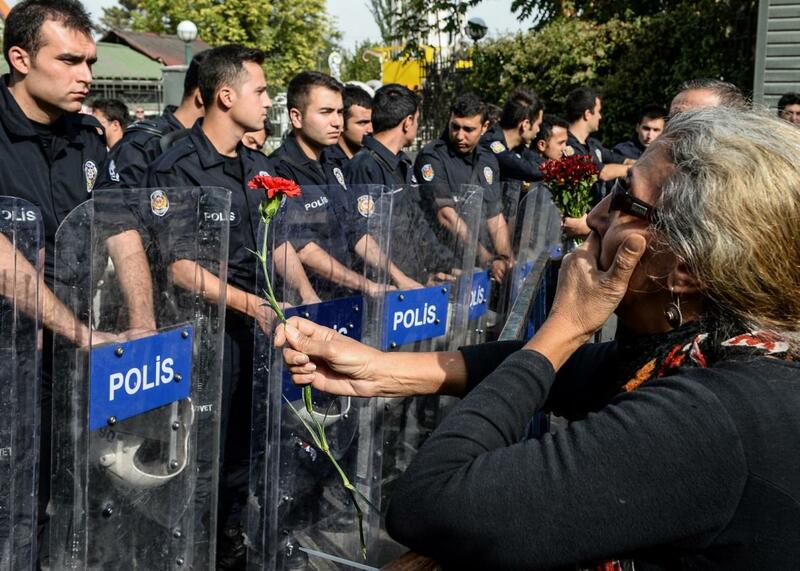 A protester holding a carnation stands behind a police barricade blocking the way to the site of Saturday’s explosions on October 11, 2015 in Ankara, Turkey. Scuffles broke out as police prevented pro-Kurdish politicians and other mourners from laying carnations at the site of two suspected suicide bombings that killed 95 people and wounded hundreds in Turkey’s deadliest attack in years. Police insisted investigators were still working at the site. Update, Oct. 11, 2015, 9:30 a.m.: The confirmed death toll from two explosions at a peace march on Saturday in Ankara, Turkey, has risen to 95, the BBC reports. A rally in honor of the dead drew a crowd of thousands to the capital city’s Sihhiye Square on Sunday, with the gathering taking place “under heavy security” and led by the same groups whose march was targeted the previous day. Reuters reports that “riot police backed by water cannon vehicles” blocked a road to keep the crowd away from nearby national government buildings. Some attending the rally did appear to blame government forces for the deaths, chanting about “murder police” and the country’s president, “Murderer Erdogan.” The government, for its part, does not yet have a single narrative to explain the attack. Unamed “senior officials” told Reuters that ISIS had been implicated in Saturday’s bombings, while Turkish politicians have publicly proposed multiple theories of which group might be behind the attack. Prime Minister Ahmet Davutoglu has speculated that ISIS or Kurdish nationalists or even radical leftists could have targeted Saturday’s march, which was organized by a leftist coalition. As authorities continue to investigate the bombings, Prime Minister Davutoglu has declared a three-day period of national mourning. Forty-eight of the injured remain in critical condition, Reuters reports, and the official death toll will likely rise as more victims are identified. TV footage shows scenes of panic and people lying on the ground covered in blood, amid protest banners. The blasts took place near the city’s central train station as people gathered for a march organized by leftist groups. No group immediately took responsibility for the explosions, which came only three weeks before a round of national elections. In addition to the death toll, which is likely to rise, authorities say that nearly 200 others were injured by the blasts. CNN notes that the Turkish government, in a reversal a policy of avoiding conflict with ISIS in neighboring Syria, has recently allowed U.S. forces to launch strikes against ISIS from an air base in southern Turkey. “If Turkey’s really hurting ISIS, then there will be attacks,” Esra Ozyurek of the London School of Economics told the network in July. In an address to the Turkish people, Prime Minister Ahmet Davutoglu called on the country to stand firm against terrorism. “This is an attack that does not target a specific group; it is an attack on the entire nation and an attack on our unity,” he said of the bombings on Saturday, according to CNN. “Turkey is a country that has managed to maintain peace in the region.” Davutoglu said the destruction was the work of two suicide bombers.